Comics may be set in the future or on a different planet, but no matter how out-of-this-world they appear to be, comics are still created in reality. Comics are not produced inside a vacuum they are connected to the historical era that they are created in. As historian Bradford Wright puts it “comic books are history” (Aiken 41). Just like other more prestigious, commonly studied types of literature comics are also worth examination, as they reflect the politics and concerns of a particular historical era (Aiken 41). The link between Canadian Golden Age comics and War World Two is easy to understand as comics of the era featured stories of fighting Nazis and Canadian soldiers winning in warfare. However, it is not that comics just reflect reality, because this would not be very appealing to audiences, especially those that were living through a world war. The most entertaining stories are those that are relatable but also present a better version of reality. In this essay, I will be arguing that comic books try to present an idealistic version of reality and what people lack in reality is presented to them in their comics. The first half of this essay, I will be using superheroes from different historical eras to demonstrate how comics changed over time to better fit the needs and wants of the current audience. 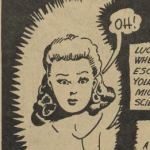 In the second half of this essay, I will be analyzing how specifically, Commando Comics issue number twelve (1944) presents an idealistic version of reality that suits the needs of Canadian children growing up in the World War Two. Comics are always adapting to our changing society. Stories and characters, that were once loved, are often altered or replaced with more modern versions. This constant changing is necessary to better provide an ideal version of reality that suits the needs of the current audience. To demonstrate this, I will be analyzing how different superheroes, from different parts of history, gave their audiences something that society was lacking. Spiderman, for example, was created during the Cold War. During the Cold War, there was a focus on young adults. Many programs were developed at this time that put American teens “in contact with peers overseas” (Scribner 542). Programs like penpals and overseas studying expanded with the goal of improving foreign relationships and overcome biases that were seen as “the root of international conflict” (Scribner 542). Spiderman being a teenager himself emphasized this “greater attention to adolescents” (Aiken 47). There is a lot of emphases that Spiderman is friendly, as he is so often called “your friendly neighbourhood Spiderman”, and he is rarely seen killing people, but rather trapping them in this web and then turning them to the police. This gentle approach to justice reflects this attitude of peace and understanding, that society was lacking at the time, and that officials were trying to teach young people during the Cold War. Just as Spiderman was the first teen superhero, Wonder Women was the first female superhero. Wonder women made her first appearance in 1941 (Akin 46). The main lesson that Wonder Women taught, was that girls did not need superpowers and that they could exceed expectations if they worked hard. For example, Wonder Women is quoted saying “You can be as strong as any boy if you’ll work hard and train yourself in athletics, the way boys do” (Akin 46). This empowering message is reflective of the changing role of women during the Second World War, while men were off at war it became “women’s patriotic duty to help the war effort, either on the home front, through volunteer work, or by taking a ‘war job’”(Hall et al. 234). At a time when society is not accustomed to women doing “men’s work” Wonder Woman gives confirmation that women can do it too, and gives readers that confidence that women can live up to society’s needs and expectations. Similarly to how Wonder Women was creating confidence in females, Captian Canuck was inspiring nationalism in Canadians. Captain Canuck was released in 1975, a time when comics and everything about them was American, “the heroes were American, the settings were largely American, and even the alluring comic-book ads… were American” (Edwardson 188). Captain Canunk was not just a Canadian version of Captian America, he had a strong moral character that “reinforced conceptions of Canadians as polite, kind, moral, heroic peacekeepers” (Edwardson 186). Canadians were lacking representation in their comics and Captain Cancuck is an icon that fills the gap in the market and gives readers a sense a pride and nationalism that they were not getting from other heroes. It is interesting to look at the heroes from different moments in history because heroes are often used as teachers for readers. They are representative of what traits society believes are good and moral. Heroes capture an ideal person, and as society’s values shift, what constitutes as an ideal person changes. In the second part of this essay, I will be looking at how Commando Comics issue number twelve (1944), not only gives a portrayal of an ideal person but also portrays an ideal reality for the children growing up in World War Two era. Commando Comics issue number twelve was published in 1944, towards the end of World War Two. In order to understand how this comic creates an ideal version of reality for Canadain children of this era, I will be analyzing aspects of the comic that usually generate criticism such as lack of female characters and the negative portrayal of racial minorities. One major criticism of comic books is that they lack female representation. A study was conducted on comic books from the 1990s to 2005 looking at the number of males characters compared to female characters, the study found that “men represented 85% of total characters” (Facciani et al. 6). And this percentage gets more drastic in older comics. The number of female characters in the twelve issue of Commando Comics is low, as there were only ten female characters. These ten females are either side characters or observers. 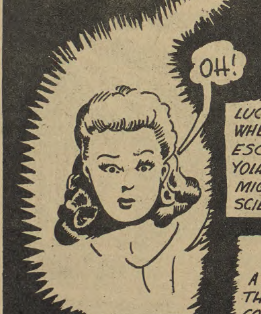 For example in the comic strip “Corvette” there is only one female character who appears twice in the comice, she says two words “Help!” and “Oh!” (Darian et al. 4). In order to understand why women were so rarely seen in comics at this time, it is important to look at the historical context and how it is at play in this comic. During World War Two, men were disappearing from children’s lives rapidly, “Older brothers, uncles and fathers enlisted in the military… Male teachers slowly abandoned the classroom for service” (Cook). Children were quickly losing the father figures and male role models that they were used to having. The hyper-masculine cast of comic books provides children with those older male role models that could no longer be there for them. This explains why the heroes in this comic are all older males, so they can more easily fit that father figure role. Women were not disappearing from children lives in the same way men were. They were busy with “paid war work as well as their normal household responsibilities” but they were still in their children’s lives (Hall et al. 234). There was less reason for females to show in up in comics because children were seeing their mother’s and sisters on a daily basis, and were not missing the female figures in their lives. In summary, children growing up War World Two were lacking father figures and male role models. Comics present an ideal version of reality by being filled with males and having older male superheroes that children can look up to, while their real-life heroes are away at war. Just as most comic book characters are male, the majority of characters are also white. A study done on the Modern Age of Comics (1991-2005) found that “aliens, demons, and other types of non-human lifeforms were more likely to be represented than all human racial minorities combined” (Facciani et al 6). It is fair to argue though, that comics during the Golden Age do have more representation of racial minorities. 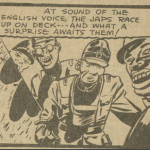 I found that about 63.6% of comics stripes in Commando Comics issue number twelve (1944) featured a racial background other than white North Americas, such as German, Japenese and Indigenous people. There is some representation of these racial groups, however, it is the way that these groups are portrayed that is problematic. For example, Japanese characters are drawn in a very particular style. They are drawn with very pointed faces, thin eyes, and large lips (Darian et al. 4). Also, the way their speech is written is done so it reads like they are speaking in a stereotypical Japanese accent. This is seen when one Japanese character says “So Solly” instead of ‘So Sorry’(Darian et al.7). This portrayal of Japanese soldiers makes them look like weak unintelligent enemies, they appear to lack a sense of strength and pride that the white North American soldiers are portrayed as having. In the comic strip, there is a close up of a German soldier’s face, his head is floating in the panel and his body is not visible. His eyes are sticking out of his head and his mouth is hanging open. (Darian et al. 14) The way he is drawn makes the German character look crazed and irrational, but it is also a humorous drawing which tells the reader to not take this character seriously. 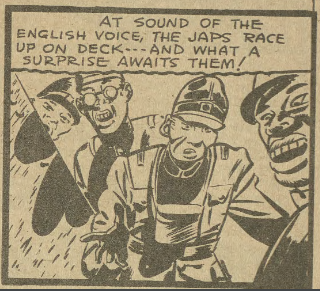 One possible explanation for the racist way that Japanese and German people are portrayed is that it helps build confidence in young Canadians that those races are not capable of winning of the war. This is a time when people were living with worry and doubt about losing their family members as well as losing the war, the racist portrayal of the enemies instills some confidence in the readers that Canadians and Americans are perhaps smarter or more serious and therefore more capable of winning the war. At a time when children are lacking complete confidence in the future of their country, comics provide them with a sense of superiority over the enemy. Comics reflect an ideal version of the audience’s society by presenting a fictional world that includes what is absent in the audience’s real world. In the first half of this essay, I use superheroes from different historical eras to demonstrate how comics change over time in order to better suit the needs of the current audience. In the second half of this essay, I examine Commando Comics issue number twelve (1944). I argue that while the comic’s lack of female characters and its problematic portrayal of Japanese and German people would be unacceptable today, it is accepted in the World War Two era because it suits the needs of the audience. I argue that the mostly all-male cast of this comic is because Canadian children were lacking males in their society during the World War Two era. I also make the claim that the humorous racist portrayal of certain characters is done in order to strengthen the potentially wavering confidence that Canada children of that era may have had about their country. It is important to not overly judge comics based on the values and ideals of modern society. It is more beneficial to critically examine comics through the eyes of the intended audience, this provides a better understanding of the comic as well as the era.